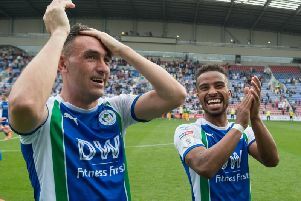 Gary Caldwell hailed the defensive strength of his Wigan Athletic side after they held out in-form Brentford to secure a valuable point on the road. Latics were under the cosh for most of an entertaining encounter at Griffin Park. But led by skipper Stephen Warnock, vice-captain Jake Buxton – who both cleared off the line in the second half – and Dan Burn, the visitors were good value for their point. “They were incredible especially Dan, who’s needed injections before the last two games to get through,” Caldwell told the Evening Post. “That shows you the kind of characters we have at the football club. Dan’s a very good player, but still relatively young for a centre half. Caldwell was also impressed with the contribution of Yanic Wildschut, whose direct attacking following his introduction just before the hour mark allowed Latics to offer just as much threat if not more so in the final quarter. “That’s what he does – he’s got real pace,” said Caldwell. “When the game gets stretched like that, he’s a real threat. But for that final ball or an end product, we might have got a result. A return of four points from the last four days means Latics have well and truly stopped the rot after seven games without a win. And Caldwell admits he can’t wait for the action to resume after the international break. “Results-wise our start to the season wasn’t good enough, but we have come out of that and have emerged stronger as a group,” he added. “I’ve never doubted myself or my players, they took the hits on the chin and have come through it.